The first thing you hand out to potential customers/clients are your business cards. It is kind of like the first impression people get about your business. Obviously, you want to make your card as original as possible; the more memorable you make it, the better! Some people go for spot gloss, to help make the words or graphics stick out more. Some people want to use such effects as gold foil, it’s classy and a real eye catcher. 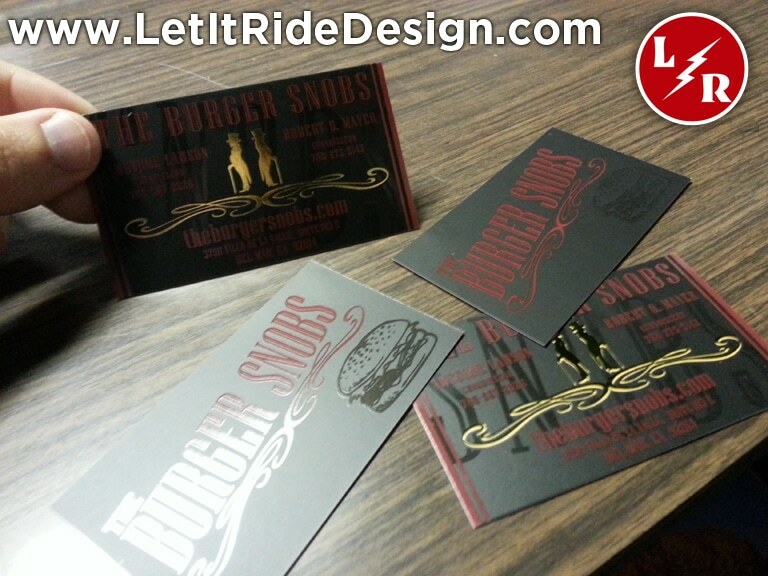 Well, we had a client who wanted to make their business cards even more special, so they used both spot gloss and spot UV, The Burger Snobs. As you can see in this picture, all of the fonts were done in Spot Gloss and we used gold foil for the logo. The card itself is a matte finish, on 16 pt paper. 16 pt is the thickest paper we offer, aside from plastic cards. We can help you create a business card that’s both impressive and memorable, let us know what you’re looking for and we’ll go from there.